I made a Mini Clueless Windoku X. The diagonals were a surprise for myself... I didn't discover them until I was making the clue set! But I was able to remove a lot of the clues once I figured it out. With so many constraints for only 4 digits, this mini-clueless-windoku-x only causes problems remembering all these different constraints. 1 . . .|. . . .
. . . .|. . . .
. . . .|. 2 . .
. . 1 .|. . . . I don't know is a 4-clue is possible. Then you'd need one clue in each seperate puzzle because without clues a seperate puzzle is never unique. I don't think there is enough interaction between the clues to make it possible. Anyone else having a hard time resisting the temptation to call a Windoku-X puzzle a Wind-X puzzle? Here is a fullsize Clueless Wind-X. 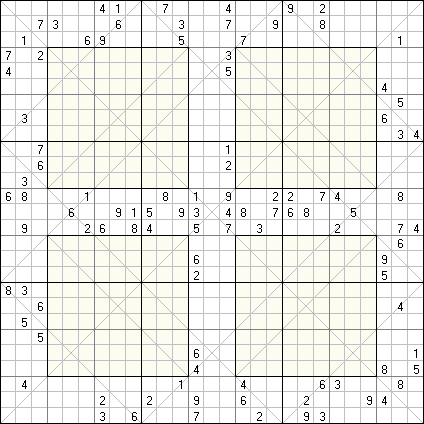 Each of the 13 constituent puzzles is a Sudoku-X. Of these, 4 are placed in a familiar Windoku pattern and completely clueless. I'm putting together the clueless grid possibility matrices. If so desired I'll post them here. Also: Ruud, Aside from the four "windows", do any of the windoku constraints apply to the whole puzzle? Like in windoku, you can extrapolate additional constraints which apply to the whole puzzle. Each row contains 3 groups (1-9). There are 18 rows which account for 2 groups (1-9), so the remaining cells must also form a group (1-9). Same principle can be applied to the columns and the 2 main diagonals of the puzzle. So there are 38 hidden groups (not 36 as I claimed). What program would you post the strings of numbers into? The "Clueless" Princess loves getting Flowers every Monday! Has anyone solved the clueless windex puzzle? Wow, I've made a quite few attempts and have hit places where I'm stuck or errors every time. I've only used pencil and paper so far. How do other people print? I hit print screen, copied into Paint Shop Pro, cropped the background from my computer, printed. Would take advice on printing. I guess I'll paste those strings into SudoCue one at a time (I answered my own question on that, finally). I'll call them Windex 1 through Windex 9, and then I'll make Windex A, B, C and D for the "pane" puzzles too. I loved the way the full-length diagonals complete themselves, btw! A very complicated but interesting way they overlap and solve various sections! Is the solution posted somewhere? I got pretty far at one point using 9 instances of SudoCue, but at one point I panicked, having forgotten about the X's in the window puzzles. I do have this puzzle printed out, using a full sheet of paper for each puzzle. This much I know: The central puzzle cracks rather quickly. I need to work up the time, space, and motivation before picking it back up again. It is an interesting piece of work, though. Screwed up on paper, tried again with SudoCue, and FINALLY got it. Fun puzzle!